Reservations for 102 Edition of the 2019 Giro d’Italia special cycling vacation is now open. The base package includes 7 days 6 nights in our four stars hotels. Plus all transportation and transfers to and from hotels along the Giro’s 2019 route. Our packages are all inclusive! The Giro d’Italia 2019 course will be announced by September 2018. However, as per tradition the Giro will start from a foreign location for the first three days, it will then resume competition in south Italy, presumably in Sicily or Calabria region and it wind it's way up to the cooler north. 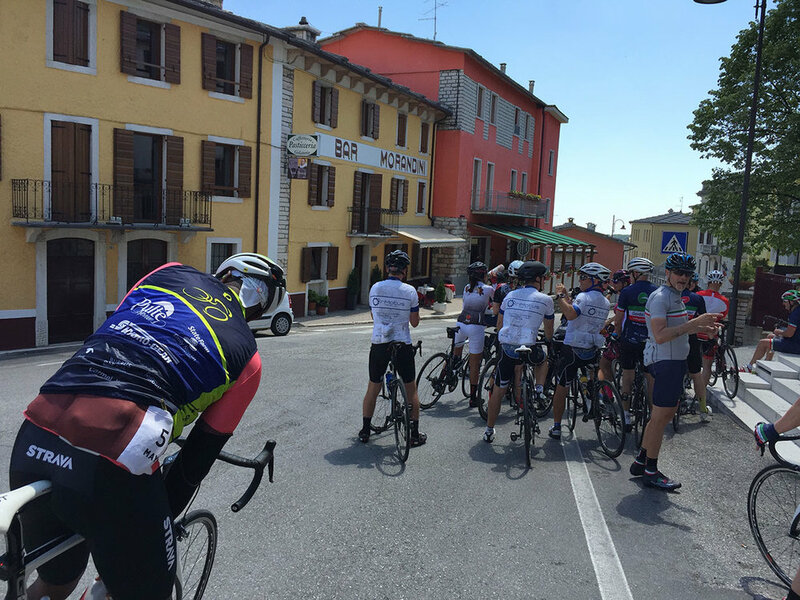 After you experience the unforgettable stages of Giro d’Italia passing through the Romagna region we’ll transfer you to the Lake Garda Hotel, where you can challenge yourself again on the stages of the Giro before the pros do. The final week of the Giro will most likely be contested on the Trentino's pink mountains, the Dolomites...and you're going to be there cheering them on. On the remaining days of the tour we'll explore Verona or we'll ride to ancient hill top castles and towns. Our organic food is prepared by local chefs who pride themselves in seeing you satisfied. The cheese and wine tasting are organized by local cantinas where every item served comes from local cheese production and wine harvest. Cesenatico is a fisherman town on the Adriatic coast of Italy. It’s the home town of Marco Pantani. Like Coppi, Pantani was revered for the transcendent manner in which he raced his celeste-green Bianchi to victories at the Giro d’Italia and Tour de France. From Cesenatico we’ll ride the course to San Marino to watch the uphill sprint of Stage 9. Next day we’ll mingle with the pros in Ravenna before the start of Stage 10. Ride Stage 10 course before heading back to hotel. We transfer to Piasco (Cuneo) where you can enjoy your stay in the medieval old town. We rise early to ride the course to Pinerolo, home of the 12 Stage of Giro d’Italia. We spend the night there because in the morning we’ll join the festival-like atmosphere of the Giro’s 13 Stage start. See the pros making final preparation. See the latest technology and lots new bikes before the actual start. We’ll ride part of the course, then relax as we head back to Piasco for next day drive to Milan-Malpensa. Enjoy the local cheese and wine testing at the local vineyard, or stroll the famous boardwalk of Cesenatico. While in Piasco you cannot miss the opportunity to savor the delicate aroma of Tartuffi on your favorite Pasta dish. Taste one of the most prestigious wines in Italy, the Montaribaldi Barbaresco, in Cuneo area. Hitting the ground...spinning. After check-in your custom-prepared bike is awaiting a test ride on the Lungomare road to Rimini. With a stop by Marco Pantani's Memorial. The Infinite Loop Trophy awarded to the winner of the Giro carries all the names of the Giro's winners since 1909. Where else would you wanna be, but in the middle of the exciting finish of the Giro, taking pictures of your favorite pro, before they take off again. We ride the Stage Course before the Pros do, than we come back to see them start the stage and get to know some of them. Day Five. From the Mediterranean Sea we transfer to Lake Garda and the Alps. Flying to Sirmione, the beautiful peninsula of Lake Garda for some speed work...and gelato. The ride around Lake Garda may includes the climb to Monte Baldo one of the challenging stages of Giro d'Italia, but it will certainly have its rewards. The final day brought us on the Fumane Pass. 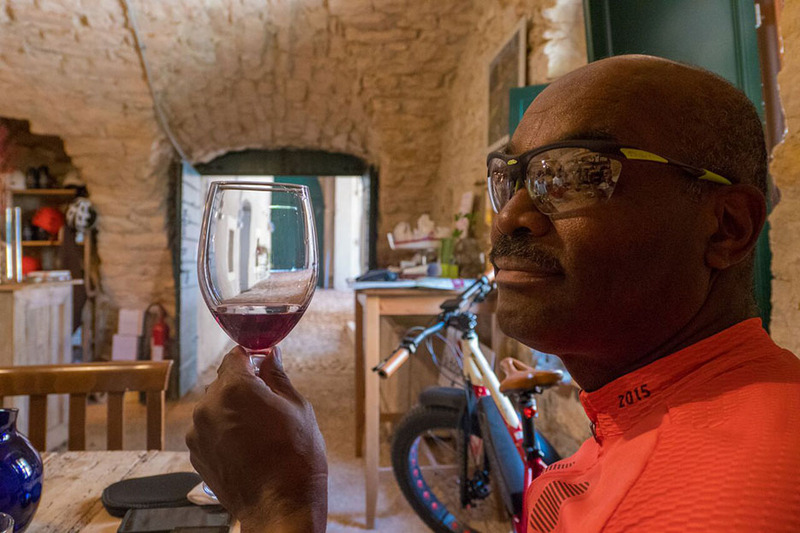 A memorable day with a spectacular climb, an exhilarating descent, a stop at the local winemaking factory for cheese and some fine wine-tasting. And a delicious 'goodby' dinner with plenty of fresh Mozzarella, Tortellini-Lasagna and wine from Mount Etna was the fitting "Gran Finale" to a once-in-a-lifetime bike vacation.